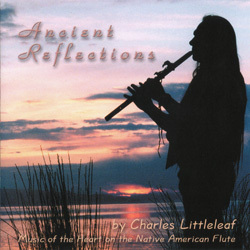 Charles Littleleaf's mastery of the Native American flute takes us through a doorway into an ancient, simpler world. Drawing from ancestral traditions and the inspiration of nature, this collection of beautiful and entrancing music combines the enchanting sounds of native musical instruments with the solitude of earth, sky and the gifts of nature. Littleleaf has grounded his beautifully melodic, healing flute playing within the essence of Mother Earth, and from memories of life growing up on the Warm Springs Indian Reservation of Oregon, and from these spiritually awakening experiences has emerged his traditional style of heartfelt music.